Stow has a long tradition of being a welcoming and friendly community, with opportunities for everyone. We are dedicated to making sure every individual, including senior citizens, children and people with disabilities, is a vital member of our community. The City is proud to provide a business friendly atmosphere for our diverse and vibrant local businesses. We work closely with the Stow-Munroe Falls Chamber of Commerce and other business organizations to encourage new and existing businesses to thrive. The Stow-Munroe Falls school system has been designated an “excellent” district by the State of Ohio and is an integral part of our City. Stow has a history of collaboration with the school district, which furthers our strong sense of community. 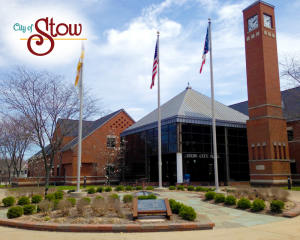 Please browse our website or call City Hall to learn more about Stow and all that we have to offer. I am honored to be the Mayor of such an outstanding community! SIGN UP TODAY! RECEIVE ALERTS! BE ALERT!